There are 3 ferry routes operating between Sweden and Gotland offering you combined total of 68 sailings per week. Destination Gotland operates 3 routes, Nynashamn to Visby runs 6 times per day, Oskarshamn to Visby about 3 times daily & Vastervik to Visby about 5 times weekly. As the frequency and duration of crossings on some routes varies we would advise that you do a live search for crossings from Sweden to Gotland to get the most up to date information. Sweden is the largest Nordic country in northern Europe, bordered by Norway to the west and Finland to the east. A country famed for its stunning landscape, Sweden also has a fast-paced capital in Stockholm, spread across 14 islands connected by 57 bridges, which brings with it a world-leading fashion scene and an immersive historic district. Further north, you’ll find untouched wilderness blanketed by snow, with dramatic mountains in the skyline, dense forest and countless reindeer in front of you and the mesmerising Northern Lights shining above. There are also plenty of beautiful islands and archipelagos dotted in the Baltic Sea. Sweden is an excellent departure point for a large number of destinations in Scandinavia and northern mainland Europe. 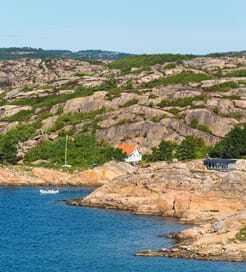 With numerous ferry ports on the country’s long coast, operated by leading ferry companies, travelling by ferry is the most convenient way to explore Sweden’s islands and neighbouring countries. Gotland is Sweden’s largest island, found in the middle of the Baltic Sea, between Latvia and the mainland’s east coast. The island has much to flaunt: over a hundred middle-ages churches, photogenic towns and villages, top-of-the-range restaurants and the nation’s sunniest climate beating down on sandy beaches. 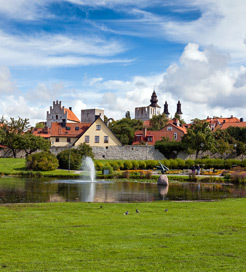 The largest and most visited settlement, Visby is one of Europe’s medieval maestros. Buildings steeped in history, fascinating ruins, idyllic cobbled streets and fairy-tale-style cottages have launched this small port town onto the UNESCO World Heritage list. And quite rightly, too. Given the ease of ferry travel from the mainland and the huge range of attractions on offer, it’s easy to see why Gotland is consistently ranked as one of Sweden’s most popular tourist destinations. You can reach Gotland from either Nynashamn or Oskarshamn, with regular crossings every day to the port of Visby.